By Sadiq Umar – The Managing Director of the International Monetary Fund (IMF), Christine Lagarde, has faulted government spending on fuel subsidy, saying Nigeria and other countries across have spent $5.2 trillion on fuel subsidy since 2015. 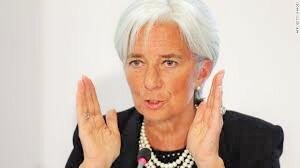 Mrs. Lagarde advised the nations to remove the huge amounts budgeted for subsidy payment, insisting it’s the right thing to do to create more funding for hospitals, roads, schools and social amenities. The IMF boss who spoke to journalists on Thursday at the ongoing spring meetings of the International Monetary Fund and World Bank Group, said such money could have been spent on health and education. “We believe that removing fuel subsidies is the right way to go, she said. Adding: “If you look at our numbers from 2015, it is no less than about $5.2 trillion that is spent on fuel subsidies and the consequences thereof. And the fiscal affairs department has actually identified, how much would have been saved fiscally but also in terms of human life if there had been the right price on carbon emission as of 2015. Numbers are quite staggering.